Food Security and Agriculture face major challenges under climate change, in terms of expected negative impacts on productivity as well as implementation of sectoral actions to limit global warming. 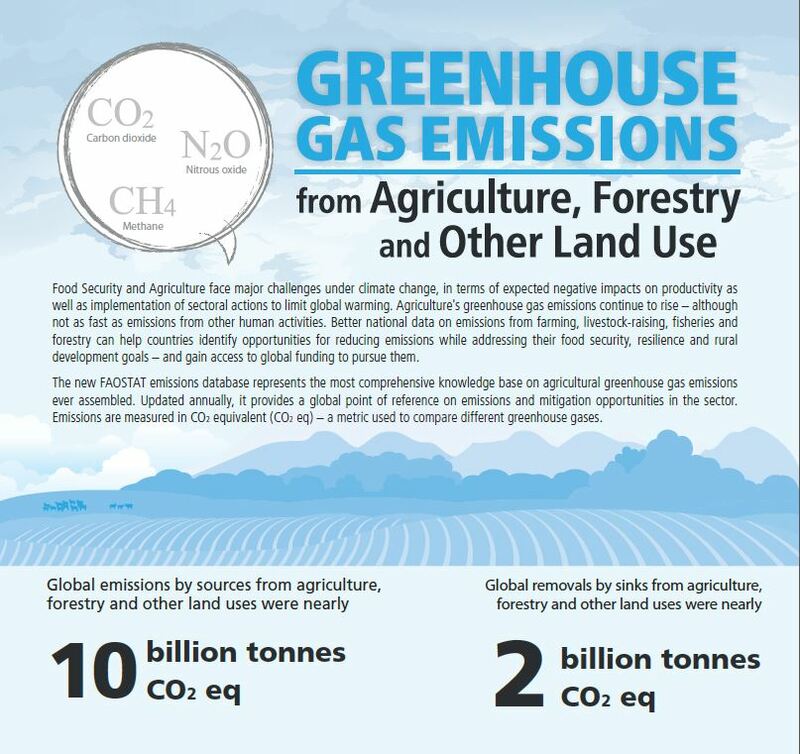 Agriculture's greenhouse gas emissions continue to rise – although not as fast as emissions from other human activities. Better national data on emissions from farming, livestock-raising, fisheries and forestry can help countries identify opportunities for reducing emissions while addressing their food security, resilience and rural development goals – and gain access to global funding to pursue them. The new FAOSTAT emissions database represents the most comprehensive knowledge base on agricultural greenhouse gas emissions ever assembled. Updated annually, it provides a global point of reference on emissions and mitigation opportunities in the sector. Emissions are measured in CO2 equivalent (CO2 eq) – a metric used to compare different greenhouse gases. Emissions from energy use in agriculture added another 705 million CO2 eq. The data include emissions from fossil fuel energy needed to power machinery, irrigation pumps and shing vessels.